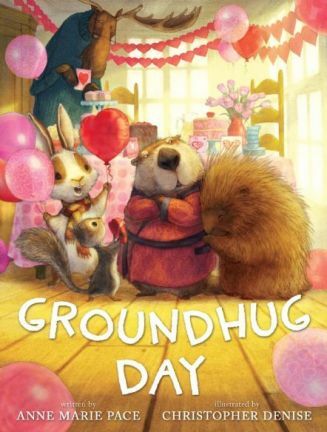 Groundhug Day is a picture book delight that seamlessly weaves a heartwarming and credible friendship story together with Groundhog Day and Valentine’s Day holidays. 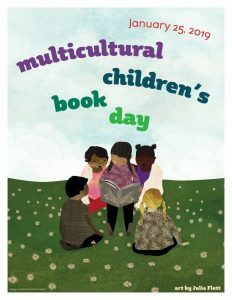 Making a themed book that can be read on more than a few days each year is a feat few authors and illustrators attempt, but the winning combination of Anne Marie Pace and Christopher Denise have managed to pull this off quite successfully! 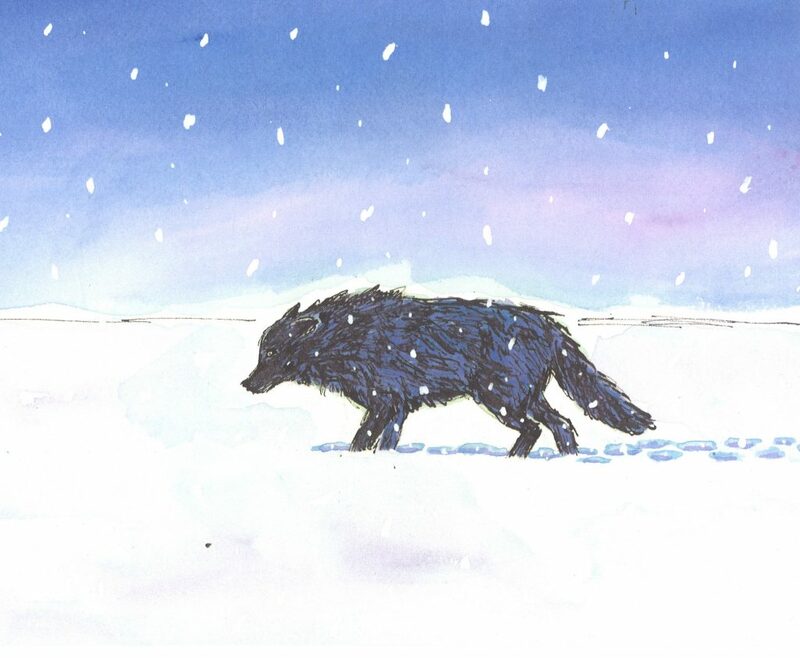 Here’s where young readers, already drawn into the story, will be treated to several beautiful pages of illustrations (in addition to to all the other striking artwork in warm welcoming tones) showing what wonderful things shadows are and can do. 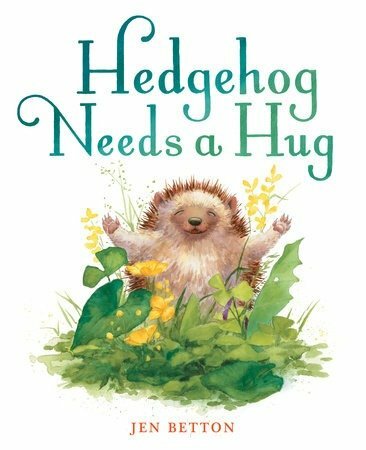 It’s easy to feel the joy both author and illustrator felt about creating this lovely picture book. More fun times are in store because, despite no longer being fearful of shadows, Groundhog must still get his six weeks of sleep! This tale, honoring the support that genuine friendship offers, is both a sweet and satisfying read that has all the feels you’d want from a picture book. This story resonated with me because, like Daddy Gnu created by late author illustrator Anna Dewdney, my husband helped our daughter decorate her very own cardboard house when she was Nelly Gnu’s age. 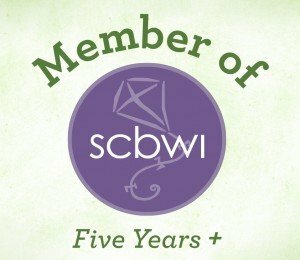 In this charming story, after making the cardboard house together, Nelly Gnu and Daddy head to the hardware store to get all the supplies needed to put the finishing touches on her “perfect little house for one!” When Nelly gets lost momentarily and panic sets in, Daddy’s there to make things right, like he always does. Between its vibrant artwork and the engaging storyline, Nelly Gnu and Daddy Too is a keeper. I loved the thoughtfulness of this 36 page hardcover with its cloth binding that will make it feel like a big-kid book to the preschool crowd. 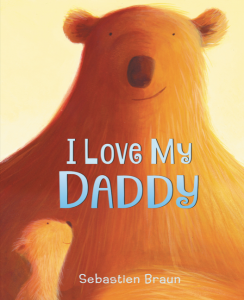 You and Me, Me and You is a celebration of dads that says so much in under 100 words! The young narrator is wise beyond his years and not only shows readers what he has learned from his father, but what he as a child can bring to the relationship. 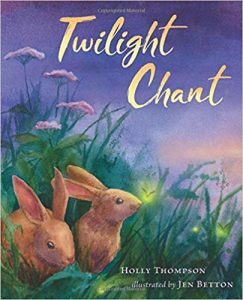 “I give you the chance to tell stories … and I help you choose words with care.” Tanco’s retro artwork does a terrific job in conveying all the meaning packed into this well-crafted picture book. 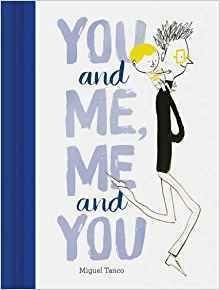 Insightful and moving, this You and Me, Me and You hits all the right marks and can be enjoyed year ’round. Cooking pancakes with dad is lots of fun but a chores list tacked on the fridge is a reminder to bother father and son that there’s lots more to be done. The only catch is most of what needs doing can be done alone, by dad. That is until the young boy finds a clever, creative way to turn making the beds into sailing a pirate ship, hanging out the laundry the same as joining a circus and watering the garden a jungle beckoning to be explored, all by dad’s side. Things to do With Dad shows that with a positive attitude, a big imagination and dad’s willing participation, a bunch of boring chores can easily become a fun, father-filled adventure. 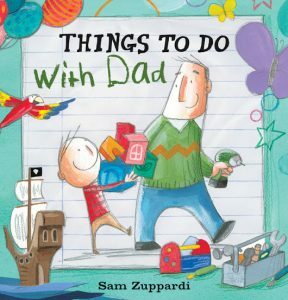 Zuppardi’s cheerful artwork is a perfect pairing for this Father’s Day delightful read. A tale of friendship, kindness, and teamwork, can be found in The Winter Train, written by award winning author Susanna Isern with illustrations by Ester Garcia, (Cuento de Luz, November 2014; $16.95, Ages 3-5). Originally written in Spanish under the title, Tren de invierno, Jon Brokenbrow has successfully translated this beautiful story into English. Every year, all of the animals in the Northern Forest, except for White Owl, Frog, and the fish, pack up their bags and board the Winter Train. They help each other prepare for their trip to a warmer climate in the Southern Forest before the snow hits. Rabbit, Wolf, and Hedgehog are all on board. Wolf, Goat, and Bat have worked out their seating arrangements, and even Tortoise has managed to get to the train on time. The train chugs along, while the animals are playing games to pass the time, when Genet (a nocturnal, catlike mammal) realizes they’ve left one of their friends behind. “But if we go back, we could get trapped in the snow,” said Beaver, pointing to the dark clouds outside the window. ‘We can’t leave Squirrel behind. She can’t stand the cold,” said Ferret. “Well, that’s settled then. Let’s go and find her!” said all the animals together. 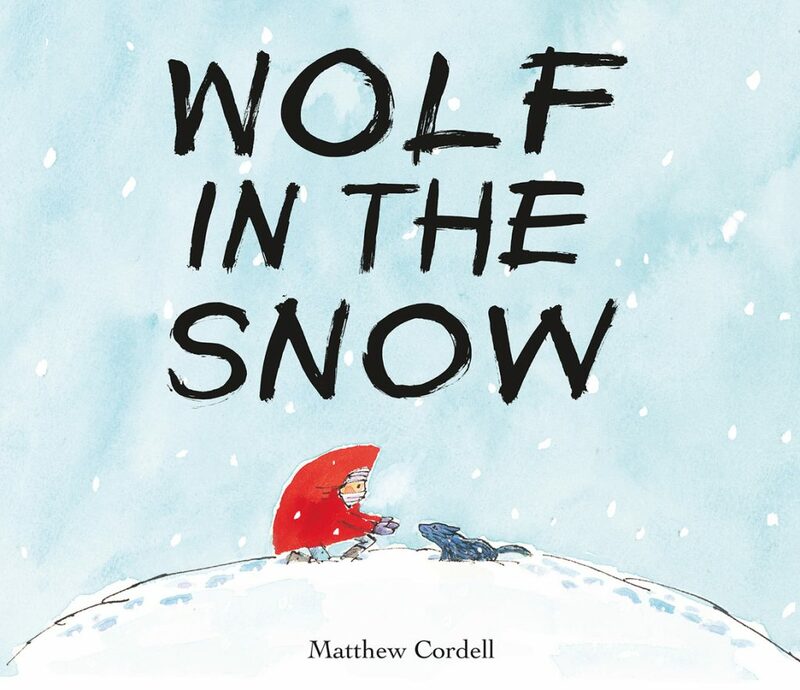 In this picture book, Garcia’s illustrations show how quickly the landscape can change when autumn turns to winter, and snow covers everything. The bravery of Genet, trotting across the snowy ground to rescue her friend, Squirrel, tugs at your heartstrings. I found myself cheering the cat along on her trek. Isern’s lyrical style of writing is both appropriate and appealing in this tender-hearted book for pre-schoolers. “You came back to rescue me!” said Squirrel, shuddering from the cold. But, of course the animals went back for their tiny friend. Who cares that a train can’t “turn around” or that in reality the animals would have eaten each other? Isern has managed to suspend our sense of reality in this wondrous magical picture book, which is sure to please the child in all of us. Found by Salina Yoon is reviewed by Rita Zobayan. Salina Yoon has created a wonderful story with Found (Walker Books for Young Readers /Bloomsbury 2014; $14.99, Ages 2-6. Bear finds a toy bunny in the forest and wants to find its owner, so he posts “found” flyers in the forest. Time passes and no one claims the bunny, and Bear becomes attached to it. It is, after all, “the most special thing he had ever seen.” But eventually Moose, the owner, spots Floppy, and Bear must prepare to part with his new, treasured toy. I won’t give away the ending, but I will say that it has just the right touch. 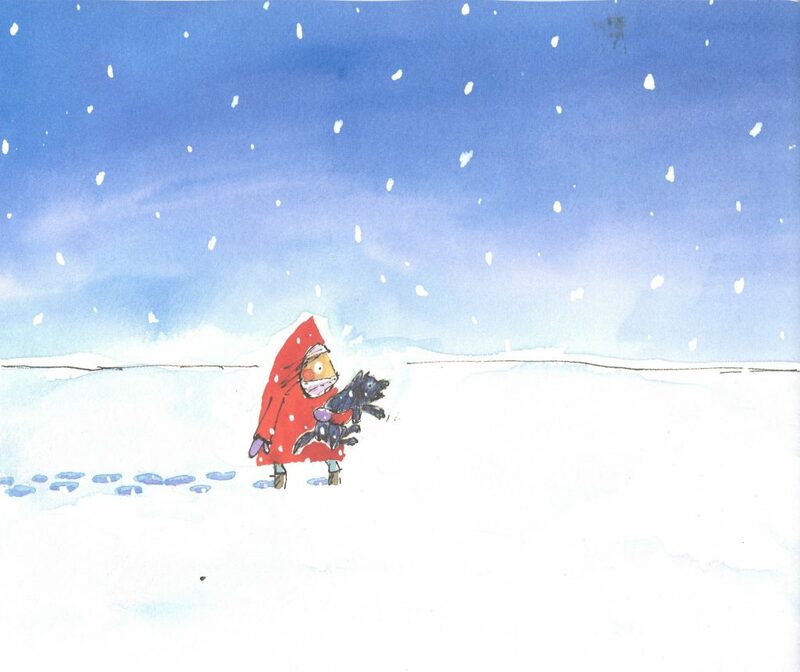 The magic of this picture book is its simplicity. The storyline is straightforward and the words are chosen perfectly for the young audience. My kindergartener greatly enjoys Found, and is transported into Bear’s world. When Moose arrives to claim Floppy, my little one’s thumb goes right in her mouth (nervous trait), and when Bear sheds a tear at the thought of parting with Floppy, my little one’s eyes well up, too. Children understand simple, pure emotion and Found presents that to them through the themes of friendship, sacrifice, and love. Your child will get lost in the world of Found, and that’s a good thing. 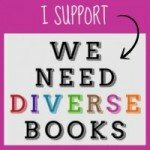 To read a review of Yoon’s Penguin in Love, click here and watch this space for a review of Penguin and Pumpkin. Flashlight by Lizi Boyd, Chronicle Books, 2014. Lizi Boyd’s wordless picture book, Flashlight (Chronicle Books, $15.99, Ages 2-6) makes darkness delightful, full of fun creatures to be found by a little boy camping out in the woods. Just one flashlight shining upwards highlights bats, a surprised looking owl and raccoons all hidden in their normally pitch black homes. Shining downwards and watch out! Some skunks are nearby. Boyd’s artwork of simple grays and whites and a touch of color creates the woodsy environment suddenly brought to life by the beam of the boy’s flashlight. There’s a chalkboard quality about the illustrations that will appeal to all ages. And it wasn’t until I turned to the second enchanting spread that I noticed the clever die cuts revealing new nighttime treasures with every turn of the page. 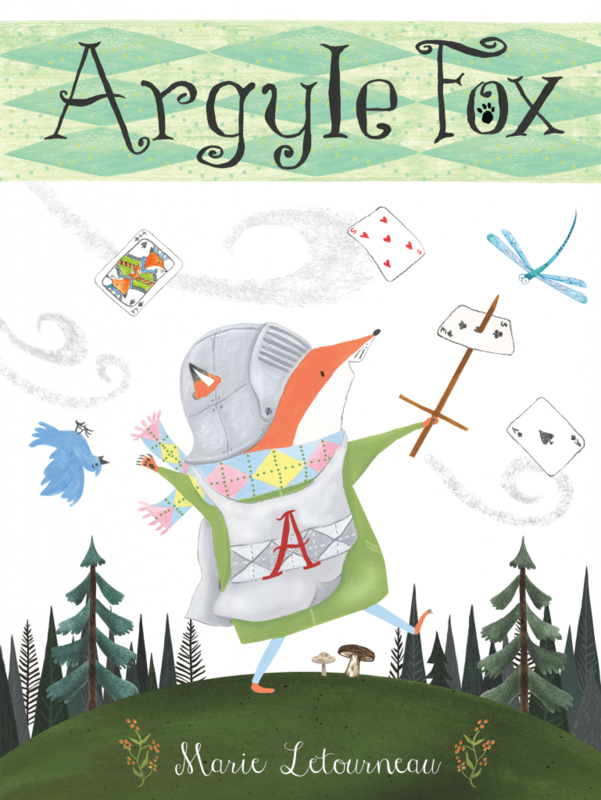 Without words, and only images to steer the story forward, this book enables parents to take advantage of a wonderful opportunity to make up a narrative or listen as youngsters invent their own tale. Boyd’s sense of humor shines, too, as the woods get more and more full of animals and then the little boy trips, only to have his flashlight picked up by one of the forest creatures, then another and more still. This unexpected yet welcome turn of events is sure to please even the littlest of readers. It will make the next camping trip your family takes a most looked-forward-to adventure. Buy this book, add an adorable roaring tiger flashlight or even a mini MagLite, and you’ve got yourself one birthday present that will light up the face of any child that receives it. 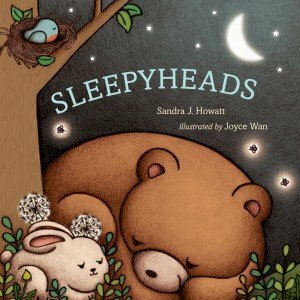 Sleepyheads written by Sandra J. Howatt and illustrated by Joyce Wan, (Beach Lane/Simon & Schuster, $16.99, Ages 2-6), is reviewed today by Cathy Ballou Mealey. Sleepyheads by Sandra J. Howatt with illustrations by Joyce Wan, Beach Lane Books, 2014. Here in the Northern Hemisphere, the sun sets quite late in the summer. I relied on room-darkening blinds and soft music to lull my toddlers to sleep when the sun was still shining. If only I had owned a copy of Sandra Howatt’s delightful, yawn-inducing Sleepyheads about a decade ago! 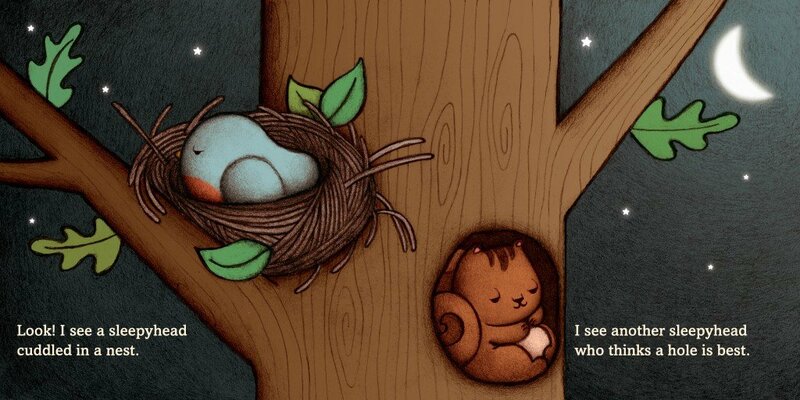 Howatt’s story begins outdoors under soft moonlight with a delightful assortment of cuddly creatures snoozing in nests, trees, caves and waves. The cozy dozers – bear, duck, rabbit, pig – are relaxed and content. Quiet oozes throughout the soft “S” assonance sprinkled through the rhyming lines. While an owl keeps vigil (This one’s not a sleepyhead – this one slept all day!) we transition inside the house where the cat and dog are sound asleep. There is one last special sleepyhead to be found, where a pillow, bed and blanket await. Interior spread from Sleepyheads by Sandra J. Howatt with illustrations by Joyce Wan, Beach Lane Books, ©2014. Wan’s illustrations are perfectly sweet, soft and soothing. Fuzzy, thick-edged images reinforce the look of deep night sky, with subtle pops of pink, green and brown. The creatures are rounded into large, simple shapes that are just right for little ones learning animal names and homes. The night sky is sprinkled with luminous, glowing stars as tiny fireflies dot pages in a lovely rhythm. Sleepyheads is just long enough, just soft enough, and just dreamy enough to cause even the most sleep-resistant tots to rub their eyes. Kirkus gave Sleepyheads a starred review, calling it “A superb execution of soporific shapes and sounds perfect for the bedside table.” Perfect for sweet nighttime tuck-ins! Where Obtained: I received a review copy from the publisher and received no other compensation. The opinions expressed here are my own. Ol’ Mama Squirrel written and illustrated by David Ezra Stein (Nancy Paulsen Books/Penguin, 2013, $16.99, Ages 3-5) is reviewed by Dornel Cerro. Ol’ Mama Squirrel by David Ezra Stein, Nancy Paulsen Books, 2013. Ol’ Mama Squirrel, having raised many litters, refuses to let any creature harm her young. Her loud and insistent scolding (“chook, chook, chook”) and threatening gestures scare away the bravest of foes. However, one day she meets up with a “great, growling grizzly bear …” who’s not so easily frightened. Repetitive words and phrases (“and that takes care of that”), make this a lively and interactive read-aloud for young children. Simple words and word sounds in large font (“PLONK”) enabled my emerging readers to participate alongside more advanced readers. Together they all roared out the bear’s evil “WA-HA-HA” laugh (I do not have a quiet library). The humorous and expressive illustrations not only extend the narrative but practically tell the story on their own. Reminiscent of his artistic work in Leaves, Stein uses deft strokes to suggest shapes and animate characters. Soft, muted watercolors and crayons fill in the outlines. Along with framed single page illustrations, Stein uses double page spreads to create larger than life characters, transforming Ol’ Mama Squirrel from a proud mother to a fearsome opponent. My students laughed uproariously at the two page spread of Mama Squirrel snarling “not on my watch buster” as she and her babies escape from grizzly bear. 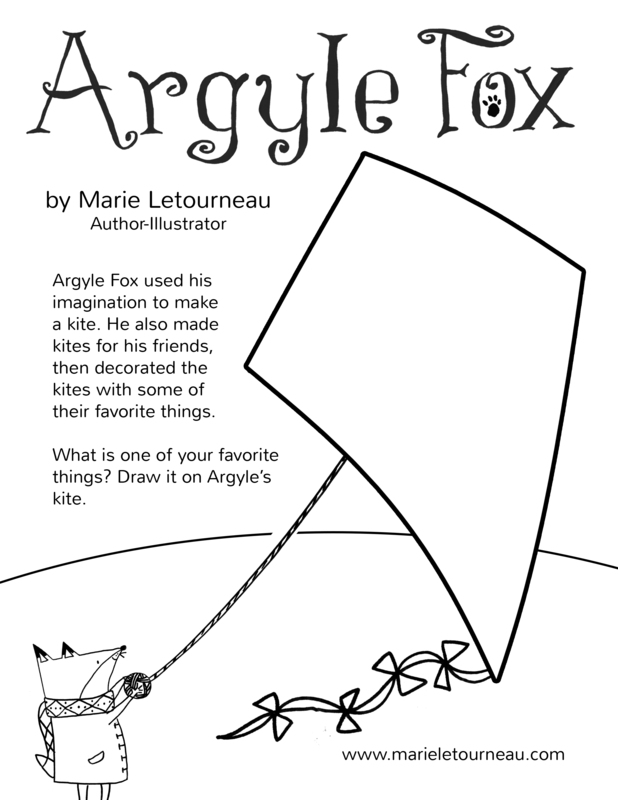 Highly recommended for children ages 3 -6, but be prepared for a rousing story time! “Goldi Rocks and the Three Bears puts a perfect twist on a beloved fairytale classic,” says reviewer MaryAnne Locher. Gold Rocks and the Three Bears by Corey Rosen Schwartz and Beth Coulton with illustrations by Nate Wragg, G.P. Putnam’s Sons, 2014. 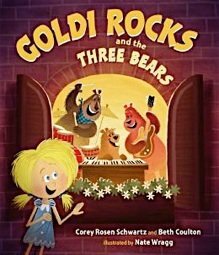 In Goldi Rocks and the Three Bears by Corey Rosen Schwartz and Beth Coulton with illustrations by Nate Wragg, (G.P. Putnam’s Sons, $16.99, Ages 5-8), the story begins with Papa, Mama, and Baby bear who have their own rock-n-roll band, but are in need of a soprano. When they leave their cottage to find one, the story, written in pitch perfect verse, follows the original tale. Goldi Rocks comes knocking on the three bears’ cottage door, only to find it unlocked, empty with some porridge cooling on the table. This is where the story takes a spin faster than a D.J. scratching records. Goldi forgets her hunger when she sees the music studio with Papa Bear’s drums, Mama Bear’s guitar, and Baby Bear’s keyboard, all of which she must try out, making a mess of things as she goes. Meanwhile, the bears are holding auditions with some other familiar fairytale characters, but none of them quite work out. The bears return home only to find the cottage a terrible mess and Goldi Rocks asleep on Baby Bear’s keyboard. the pitch was a perfect high C! The three bears quickly forget about the mess Goldi had made once they hear her fine soprano voice, and ask her to join the band. Corey Rosen Schwartz is no stranger to the fractured fairytale, her previous success being The Three Ninja Pigs, but forming a duo with co-author Beth Coulton makes for a chart topper! This may be Wragg’s debut picture book, but his background in animating projects including Ratatouille, Toy Story 3, and Puss in Boots give him the chops needed to bring this book to life through his illustrations. Just as the band’s song,“Too Hot, Too Cold, or Just Right?” is a hit single, I believe this book will be as well. 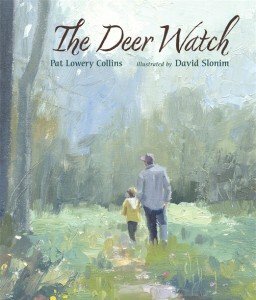 The Deer Watch by Pat Lowery Collins (Candlewick, $15.99, Ages 3-7) is a quiet book. 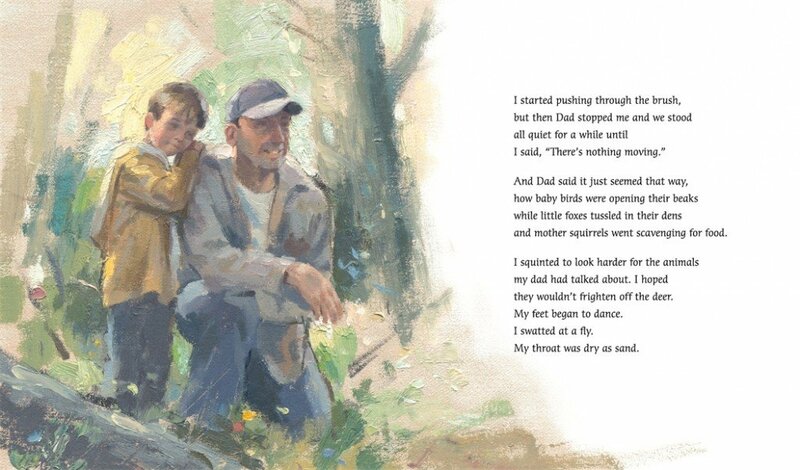 While there was not a lot of action and adventure in its 32 pages, I found myself drawn in by the promise a father made to his little boy, that this would be the summer they saw a deer. This beautifully illustrated book, with oil paintings by David Slonim, took me back in time to treasured memories of communing with nature. As our civilization takes over more and more land, our jobs (and electronics) take up more and more of our time, and our children are under so much pressure to succeed at such a young age, an outing in nature allows us to reconnect on a deeper level. There are so many lessons that can’t be learned in school. Take a hike through The Deer Watch, with a boy and his father. Meet the construction crew who, with their noisy equipment scares, the deer away from the corn the hunters left as bait. Ironically, they are saving them while at the same time pushing them out of their natural habitat. Interior illustration from The Deer Watch by Pat Lowery Collins with illustrations by David Slonim, Candlewick Press, 2013. We see all types of interesting wildlife as we turn the pages, but like the young boy in the book, our goal is to see a deer, and more importantly, to have a promise kept. And, just as the boy’s father doesn’t disappoint, neither shall the book. I adored this moving story of anticipation and discovery, but would recommend it more for children 4-8 years old. Younger children might get a little squirmy as the boy in the story does when he has to wait quietly to spot a deer. However the reward of father and son sharing this special experience is well worth the wait.